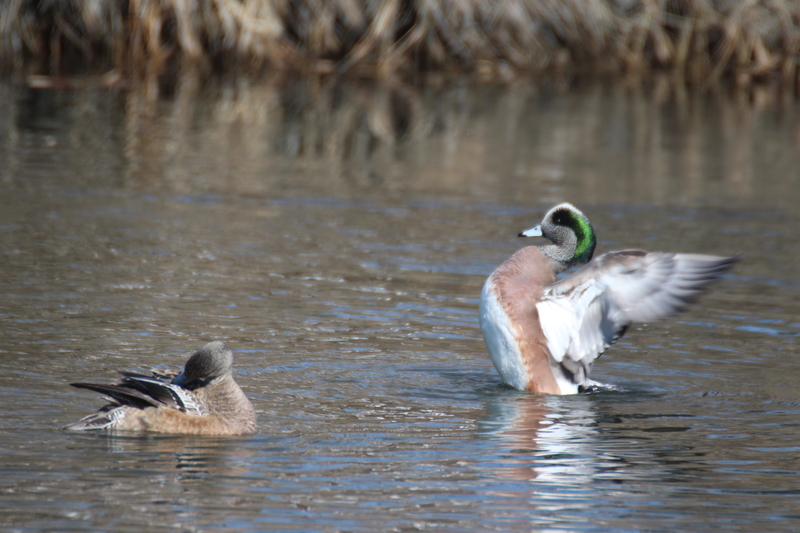 Here’s a copy/pasted release from Connecticut DEEP on the 2014 Midwinter Waterfowl Survey. I don’t particularly like using press releases on this site, but as many of you know, I have a soft spot for waterfowl, so any news on that front is worth getting out there. Plus, the results were particularly good this year. At least the photo is mine! American Wigeon in Norwalk, CT.
Staff from Connecticut’s Department of Energy and Environmental Protection (DEEP) conducted the annual Midwinter Waterfowl Survey on January 8 and 9, 2014. The survey is conducted throughout the Atlantic Flyway, and is used as an index of long-term wintering waterfowl trends. The Atlantic Flyway is a bird migration route that generally follows the Atlantic Coast of North America and the Appalachian Mountains. In Connecticut, the survey is conducted from a helicopter and a census is obtained from the coast, the three major river systems, and selected inland lakes and reservoirs. Survey conditions for the 2014 Midwinter Waterfowl Survey were excellent, with extremely cold weather preceding and during the survey. Large blocks of ice were present on all three of the major rivers (Thames, Connecticut, Housatonic), most inland waterbodies were frozen, and many coastal marshes were icebound. The midwinter survey is designed to index wintering waterfowl that have been pushed to the coast when inland waters freeze. The total number of ducks observed during the survey was 19,375. This is higher than both the five-year and 10-year averages. The puddle duck count of 10,141 was twice the recent five-year average of 4,734, and well above the 10-year average of 3,700. The scaup count was the highest since 2011. Scaup were observed in many areas on the survey, albeit in smaller groups than normal. Scaup wintering numbers in Connecticut continue to be lower than historical counts. The decline in the continental scaup population continues to be a concern for biologists nationwide. Habitat changes on the scaup’s breeding grounds may be a factor in the long-term decline of the population. Atlantic brant numbers were lower than in previous years, while Canada goose counts were the highest since 1994. Species 2014 2013 Five-year Avg. This entry was posted in Birding news, Ducks, Long Island Sound and tagged Chris Bosak, CT DEEP, New England Birds, New England waterfowl, waterfowl, waterfowl survey by Chris Bosak. Bookmark the permalink.